It’s just two weeks left until All Hallow’s Eve hits, and there’s so many ghastly things happening ahead of the event that’s considered a grand celebration of all things truly scary, frightful, and bizarre in this world. Those tuned in to things that are dead and unexplainable have already gotten their fix last Sunday with the return of “The Walking Dead” – which is now in its Sixth Season and promises to deliver more ghouls and gore in its new set of episodes that chronicle the continuing story of human survival amidst a world nearly consumed by zombie apocalypse. With interest in zombies and the dead now becoming prominent once more, new undead fans are now starting to look back at the classics – particularly the films by horror icon George A. Romero. 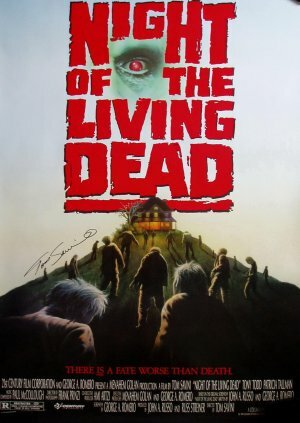 Known for blending gore and satire in his movies, Romero created what is considered one of the most revolutionary horror movies ever in Night of the Living Dead – shot entirely with a small budget and featuring the first clear depiction of the dead returning to life and consuming human flesh. That public domain of a film ws so successful that it spawned a series of sequels by Romero and then a following of imitations and spin-offs, eventually gaining cult status and molding what we know of the zombie genre today. For this special pre-Halloween 2015 post, let’s revisit the very first remake of Night of the Living Dead – one that featured more contemporary elements and updated the way the zombies looked – as decomposing pieces of rotting corpses just hell bent on attacking the living. This one was directed special effects and make-up veteran Tom Savini, who has worked with Romero since the 70’s and even other notable horror franchises such as the Creepshow and Friday the 13th series. 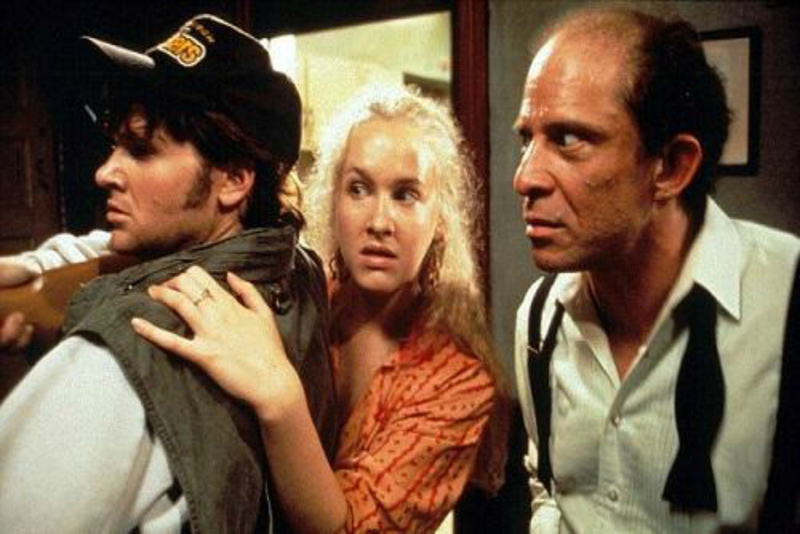 Turning 25 years this month, let’s all revisit the 1990 remake of “Night of the Living Dead”. 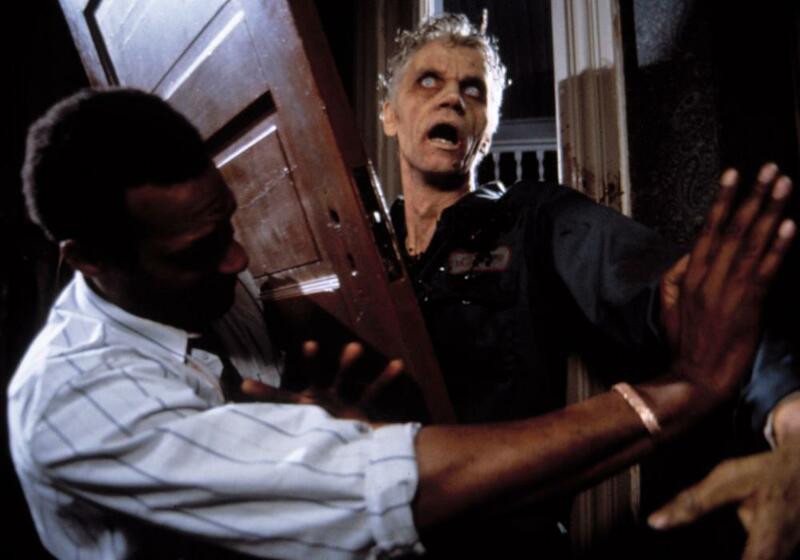 Released in theaters on October 19, 1990, the Night of the Living Dead remake essentially followed the same storyline as the original, but added some major alterations to plot points, characterization, action, and the ending that effectively made it a new movie on its own. 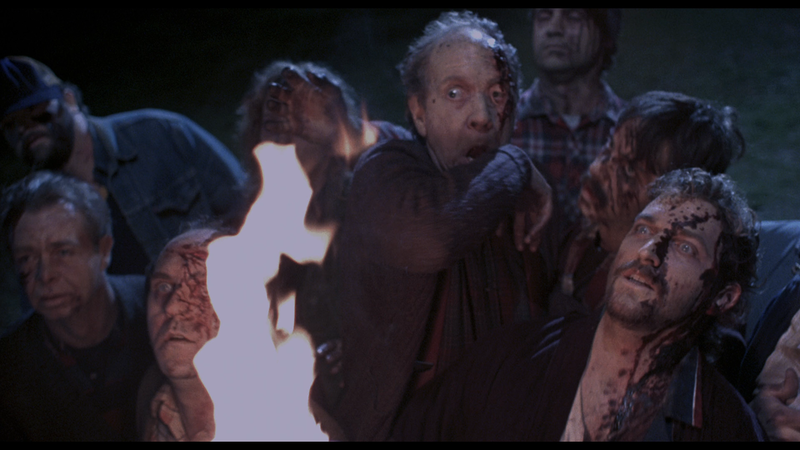 However, this unique retelling still kept the main theme – which focuses on a group of survivors that gather and are forced to hole themselves up in an isolated farmhouse when the dead start rising and attack any living thing they see. Unfortunately that’s where the social commentary and satire themes kick in, as hostilities, paranoia, and different people unable to cooperate with one another soon become more of a threat to the group than the zombies themselves. 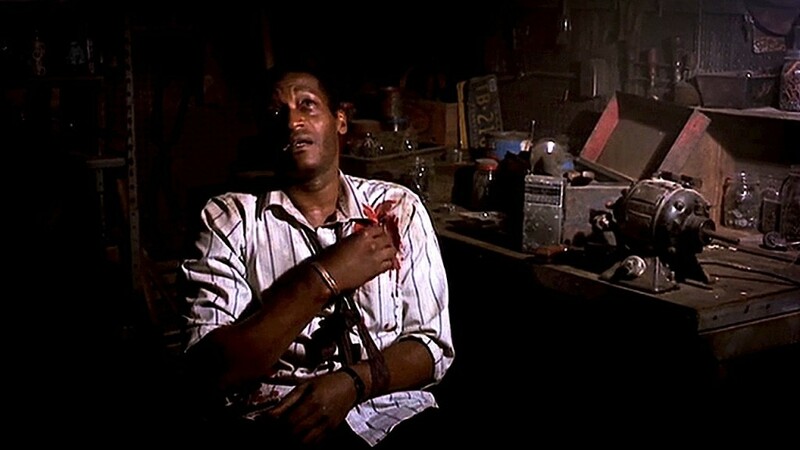 The cast of the 90’s Night of the Living Dead film is also a remarkable set of actors – Tony Todd, best known for being a horror icon presence in the Candyman and Final Destination films, made one of his early film appearances and headlined this horror remake playing the lead part of Ben – an African American man who uses his wits and tries to do the right thing while trying to stay alive. Patricia Tallman plays Barbara – a character that was essentially attacked and remained catatonic in the original 1968 film, but is depicted as a stronger woman who fights to survive thanks to Ben’s inspiration. The rest of the survivors are rounded up by a young redneck couple in Tom and Judy Rose, and the Cooper family comprised of the uncooperative and antagonistic Harry, his scared wife Helen, and their daughter Sarah who is unconscious after being bitten in the arm by a zombie. Despite trying to work together to stay alive, Ben and Harry Cooper can’t get along due to their different ideologies on how to keep safe – Cooper wants everyone to go down to the Cellar Basement and wait for help, while Ben believes the only way to prevent the dead from rushing in is to board up the house and fight back. It’s a back and forth internal struggle that increases paranoia and resentment amongst one another – the kind that makes everyone lose and the zombies win. Eventually a very desperate plan is hatched by the crew when they find a key that supposedly opens the gas pump nearby. With Ben previously arriving at the scene with a nearly empty truck, he, Tom, and Judy decide to brave the undead horde that swarms the farmhouse. Unfortunately for the group, the key is not for the gas pump and Tom impulsively shoots the lock with his shotgun, which leaks gas and lights up a torch in the back of the truck – killing him and Judy in the process. Ben watches helplessly from a distance and decides to rush back to the house to regroup with the others, but Cooper’s hostility and resentment of things makes him challenge Barbara for the gun, which he gets but not without some zombies giving him a scare. Unfortunately for Harry, his daughter Sarah becomes a zombie after succumbing to her bite wounds, and what was once a sweet loving child becomes an undead monster that kills her own mother Helen in the process by inflicting a fatal bite to her neck. Despite making in back, Ben and Harry have a shooting standoff over killing Sarah, which wounds both men. Barbara eventually put’s Cooper’s daughter out of her misery, and is urged to leave by the wounded Ben, making the trip to look for help while avoiding the slow moving she runs into outside. With the dead successfully invading the farmhouse, Cooper holes himself up in the attic while Ben goes down the cellar, where he finds the reanimated Helen and shoots her down. He finds a radio and listens to broadcasts of what’s going on in the outside world… And ironically finds the key to the gas pump, laughing in disbelief and in a moment of utter madness. Inevitably, Barbara does find help in a couple of rednecks who are hunting the undead. Eventually as night passes and morning comes, she and an army of coordinated human beings are able to eliminate the zombies and come back to the farmhouse. She finds Ben after the cellar is broken open with a chainsaw… Yet too late as her friend is zombified and barely alive enough to recognize her. After he is put down and she grieves for his loss, a hand comes from behind and she finds the very much alive Harry Cooper, who says “she came back”. In a fit of rage, Barbara pulls out her revolver and kills Cooper, earning a measure of revenge for his selfish actions and saying to her fellow zombie hunters to “set another one for the fire”. In the end, Barbara watches as all the corpses are being set ablaze on a bonfire, reflecting on the nightmare that has passed but also on a remark she made earlier on how humanity and zombies are not so different after all despite the situation. 25 years later and still owning up as one of the definite horror movie classics that had a worthy remake, Night of the Living Dead is another fine example of what horrors we can imagine and conjure up, but also place the monsters as unwitting victims of humanity’s own hubris and nature that come back to them as a gory consequence head on. It’s never revealed where the true origins of the zombie outbreak lie, and that’s something that’s carried over to sequels and spinoffs as a mystery that lingers on. Even The Walking Dead follows the same pattern and doesn’t explain that much, only concentrating on humanity’s attempts to survive, stay alive, and eventually try to work together or kill each other depending on the circumstances. Movies like these are tomes and tributes to social commentary that visionaries like George Romero can bring to life in film, and it’s very much a good watch for Halloween season. Previous articleMore ESSEN SPIEL 2015 Games You’ll Want to Watch Out For! Deadpool Test-Footage leaked and it’s loco! Waaay loco!